Francisco Sánchez is the Under Secretary of Commerce for International Trade. 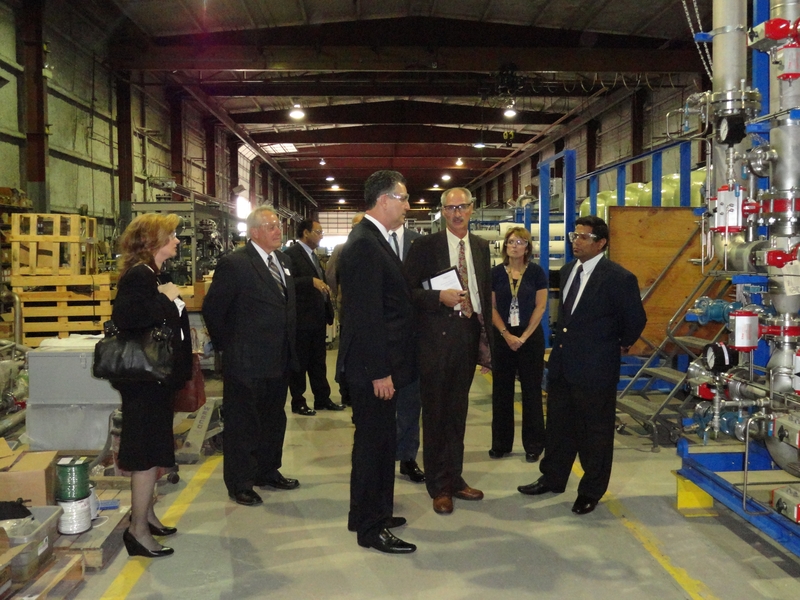 Yesterday I toured Aquatech International’s facility in Canonsburg, right outside of Pittsburgh. The company has been working with Commerce Department staff to export more of their products, and it was great to see up close the great work being done at their facilities. (from left to right) Lyn Doverspike, Director of the Commercial Service Pittsburgh Office, Harlan Shober, Washington County Commissioner, Under Secretary Francisco Sanchez, Nate Nevela, District Field Director for U.S. Congressman Tim Murphy , Dennis Gray, Aquatech Vice President of Operations and R.Suresh Kumar, Vice President (Projects) Infrastructure – Major Projects. Established in 1981, Aquatech is a global leader in water purification technology for the world’s industrial and infrastructure markets, with a focus on desalination, water reuse and zero liquid discharge. Aquatech is also a socially responsible company. Their products help to solve the problem of water scarcity abroad. They also help support numerous nonprofits that work to provide clean water to those without access to drinkable water. Our visit to Aquatech is a part of wider Department of Commerce campaign, announced last month, called “Commerce Comes to Your Town.” Here at the International Trade Administration (ITA), we stand ready to provide American businesses the tools and resources they need to export their goods and services all around the globe, grow their businesses, and create more good-paying manufacturing jobs for Americans. I can’t stress enough how important exports are for America’s economic future. Forty-one companies that successfully grew their exports recently received the President’s “E” Award during a ceremony at the White House. As part of “Commerce Comes to Your Town,” I’ve spoken in towns across the country and met with business leaders to get their input and spread our message. In fact, earlier in the day, I attended the TechBelt Export Summit in Youngstown, Ohio, where I was able to speak about how important exports are to that region. Nationally, exports support 9.7 million American jobs, many of them from the manufacturing industry which has seen nearly 500,000 new jobs created in the past 27 months. Exports have provided Aquatech with new growth opportunities that help support good-paying local jobs in the Pittsburgh area. Demand for its products is strong across the globe, and exports account for 50 percent of sales. Not only that, but Aquatech has grown to more than 600 employees since they were founded in 1981 and expect to add 30 to 50 new jobs in the near future due to growth in overseas markets. We’re not the first to have noticed their achievements. Aquatech has received awards as far back as 1995, and they received the Export-Import Bank’s Small Business Exporter of the Year Award in 2009. Aquatech is just one of many companies that I’ve had the honor to meet with that has been able to take advantage of the tremendous growth opportunities offered by exports. Given that roughly 80 percent of the world’s purchasing power resides outside the U.S., there are plenty more opportunities. The Commerce Department is committed to helping businesses seek out these opportunities to grow their businesses and employ American workers. To access these resources, I urge everyone to reach out to your local trade specialists to talk about opportunities. Visit our www.export.gov website to learn more about exporting. From assessing your export readiness, learning what it takes to begin exporting, to finding export opportunities to contacting a local trade specialist in “Your Town” to help you take advantage of exporting, it’s all there.